Leather flower medallion on diamond piece is held up by Roman laces and toe separator to create this Roman-looking leather sandal. The Delilah biblical sandal by Camel Sandals features a large diamond-shaped piece of leather over the instep. The leather is decorated with a simple flower and embellished with a row of raised dots between two rows of top-stitching that run around the edges of the diamond. 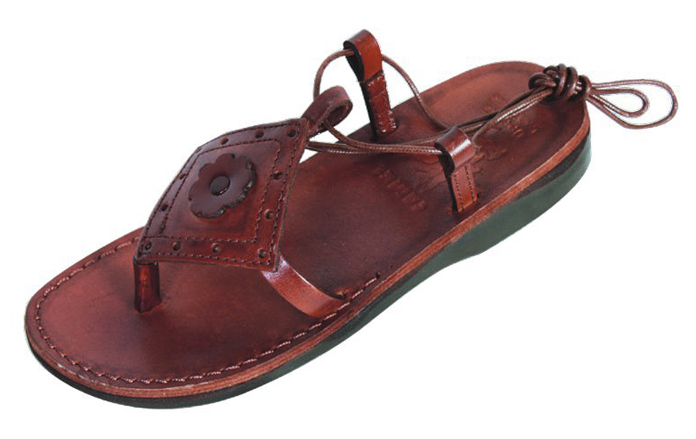 The main feature is anchored to the leather sole with two small pieces of smooth leather. A toe separator is bound in leather to prevent chafing. These fashionable leather sandals fasten with long Roman laces that are crossed up the lower leg and tied gladiator-style. Note: The Delilah sandal is a new style. Please allow up to 15 days for your hand-sewn sandal to be finished. This lace-up model is an updated take on leather sandals that have been discovered at archeological sites in Israel dating back over 2000 years. One can easily imagine our ancestors in ancient Israel wearing similar footwear.